Combine engineering and alternative energy (solar, hydro & wind)! Build cars, cranes, drawbridges, etc. 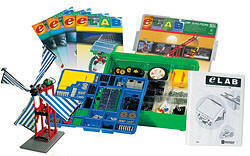 from LEGO� kits and operate them using alternative energy sources. Students working in teams will start with electricity and use a multimeter to measure continuity, resistance, and voltage. Adding concrete experiments with wind, water, and solar panels produces a high-powered and high-energy course! Building projects include: waterwheel, windmill, Ferris wheel, and solar car. Students achieve an understanding of how energy is developed from the Sun, wind, and water. Solar energy can be captured by the LEGO� Solar Cell and used to power their models. On the last day students will use the concepts they learned to design and create a test car to complete against their classmates.